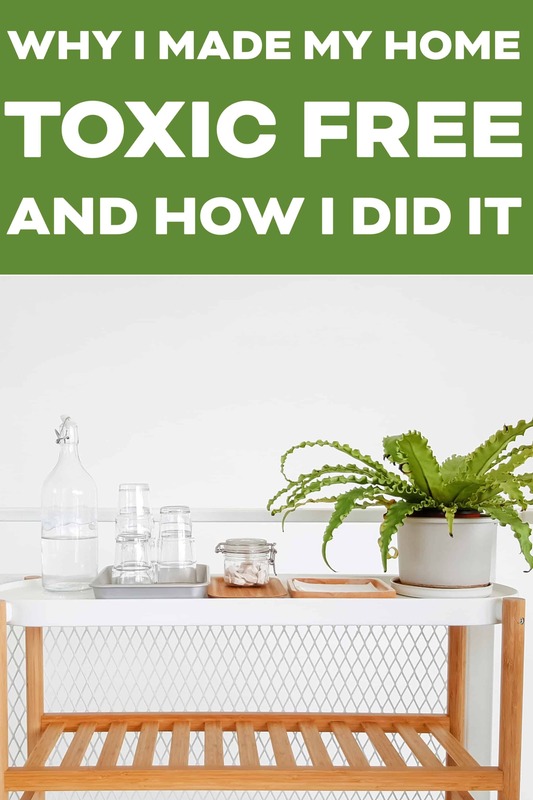 Why I decided to rid my home off all toxins and harmful chemicals, as well as how I did it. 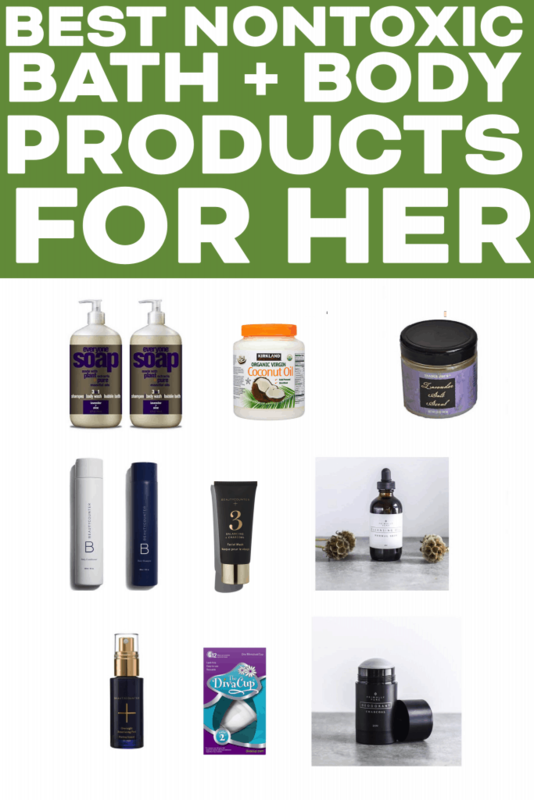 Sharing the non-toxic products I chose and love! You too can have a natural, clean living home! Along with eating clean and putting the purest food IN my body, I want to make sure I’m using non-toxic products in my home and ON my body. Our skin is our largest organ, and it absorbs everything we put on it. Right now there are over 80,000 chemicals on the market that are not well regulated. Many of them are used in our cookware, our cleaning products, our body products and our cosmetics. The number of cases of cancer, autism, alzheimer’s, heart disease, etc are higher than ever. This is due to the amount of toxins in our food, our products, and in our environment. By reducing your exposure to these chemicals, you are reducing your risk to these diseases, and helping the planet. It’s a win win! What Toxins Should You Avoid? 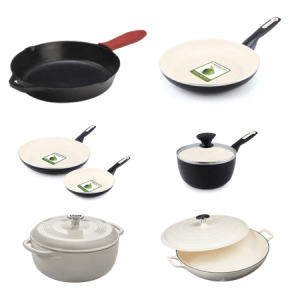 Teflon, or any nonstick cookware (on your pans, bakeware, etc). The coating chips, you ingest it, and it disrupts your hormones and your health. Here’s more info on why it’s bad. Parabens are a synthetic (manmade, not from nature) chemical that are used to preserve the shelf life of body and makeup products. It is a known endocrine disrupter and damages your health. Here’s more info on why parabens are bad. Sulfates are a synthetic (manmade, not from nature) chemical that are used to make things foam up and lather. You find it in soap, body wash, shampoo, etc. It has a ton of different names, but always has the word sulfate in there somewhere. Here’s more info on why sulfates are bad. Aluminum is found in most deodorants and in a lot of cookware. Your body absorbs the aluminum, and research shows it can elevate your risk to cancer, alzheimer’s, and more. Here’s more info on why aluminum is bad. Fragrance is found in almost all bath, body, perfumes, household cleaners and cosmetics. The FDA does not require companies to disclose what they use in their “fragrance” so it can be protected as trade secret. To avoid listing out harmful chemicals used in a product on the ingredients label, a company will instead add it to their “fragrance” and not have to disclose it. If there is a reason a company wants to keep something a secret, it’s usually a sign they are hiding something. I only use products that use pure essential oils to add a scent to it. Here’s more info on why fragrance is bad. Pesticides are harmful chemicals we spray on plants to kill weeds, prevent bugs from eating our food, and prevent rot and infection on our food crops. If it’s killing bugs and plants, what do you think it’s doing to our body when we eat it? This is why you want to always eat organic. Here’s more info on why pesticides are bad. GMO food is Genetically Modified Organisms are plants and food that have been scientifically altered. Usually this is to help it grow faster, have a longer shelf life, or resist disease. Much of our food is engineered to have the pesticide within it as it grows. Imagine how harmful this is to our body when we ingest it. Here’s more info on why GMO is bad. The book It Feels Good to Feel Good: Learn to eliminate toxins, reduce inflammation and feel great again by Cheryl Meyer – I learned so much from this book! She covers everything and is a wealth of knowledge! Great place to start. The documentary In Defense of Food by PBS + Michael Pollan on Netflix – I love Michael Pollan! This is a great overview of the changes in the food industry, and how it is effecting our health. The documentary The Devil We Know on Netflix – This covers all the harmful effects of Teflon and nonstick products, and the importance of only drinking filtered water. The documentary Stink! on Netflix – This covers the dangers of fragrance and other synthetic chemicals in our home and body products, and their link to an elevated risk of cancer and disease. The website EWG is a huge wealth of knowledge of the best practices for choosing safer food, home and body products. They even have a Skin Deep and Healthy Home section where they rate the chemicals in body, home and beauty products! Great resource if you want to look up the toxicity in your favorite products. They even have an app for your phone so you can scan the barcodes of your favorite products and use it while in stores! It can feel overwhelming to purge your home and go toxic free, especially when you realize there are toxic chemicals in basically EVERYTHING! First, it’s best not to get scared and panic. Don’t let this cause you anxiety and fear, because that is another form of toxicity to your mood and mental health. Instead, spin it in your mind and tell yourself you are grateful for this knowledge and will find joy in making better choices moving forward. Second, set a budget. I set aside $300 a month to make non-toxic swaps in my home. This way it was gradual, and my husband didn’t have a heart attack when he got our card statements at the end of the month. Altogether it took us about 4 months, so around $1200. My food and pantry was already non-toxic. If yours isn’t it may cost more. Third, be ok that it will take a bit of time to make all the swaps to toxic free. It felt weird using toxic makeup products for 2 months, since I swapped over my makeup in month 3. I found myself using makeup a lot less. But, when I did wear makeup, I tried not to let it make me feel bad for using it, and instead focused on how every day was 1 day closer until I could make the swap to cleaner makeup. This is an extremely comprehensive post where I share everything you need to know about eating clean, organic, chemical and preservative free food! It has grocery shopping guides, meal planning templates, how I stock my fridge and pantry, as well as tons of recipes! 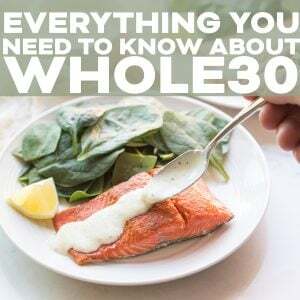 We eat Whole30 compliant about 80% of the time. Part of our food freedom also includes pure maple syrup, coconut sugar, honey, and occasionally rice. Do what is best for you and your family! This is a roundup post where I share all my cookware, bakeware, kitchen utensils and kitchen electronics! My kitchen is now completely toxic free, and I love all the cookware swap outs I found. 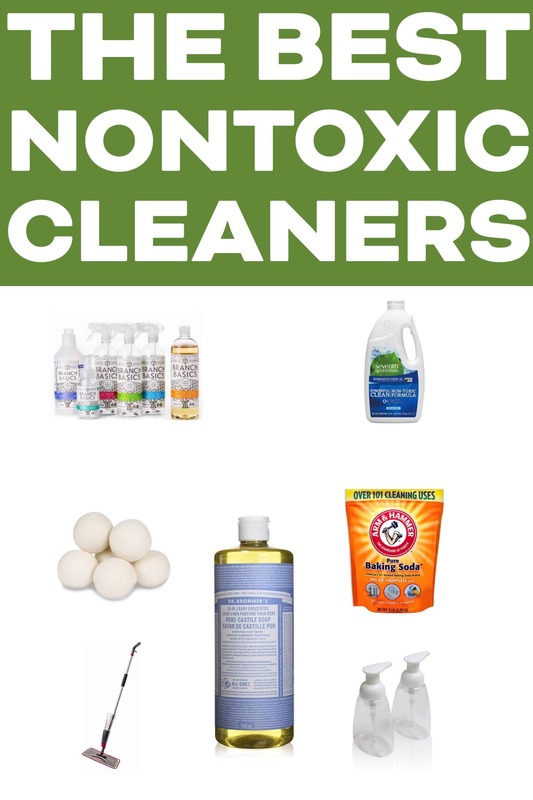 This is a post linking to my favorite toxic free home cleaning products I use for surfaces, glass, mirror, laundry, floors and hand soap. 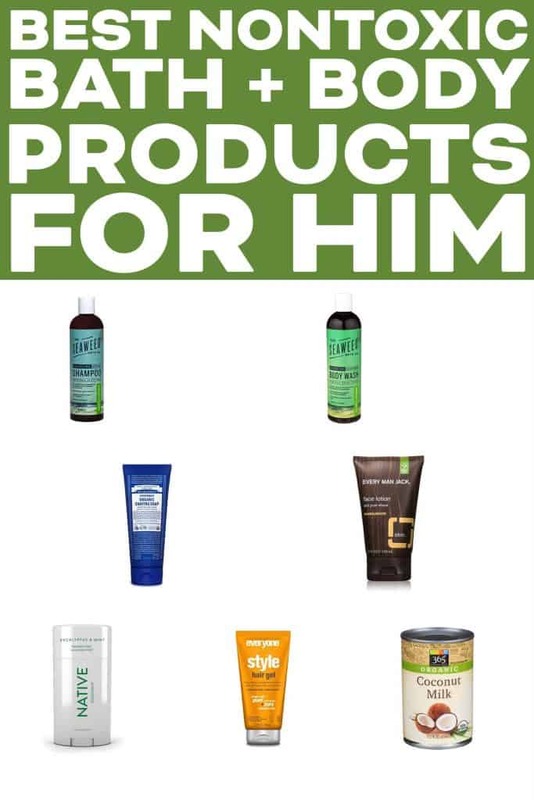 Here I share all of my favorite bath and body products that I love and also that my husband loves. Shower, skincare, deodorant, and oral health! I also have a video of my nighttime skin care routine using my 2 favorite products. 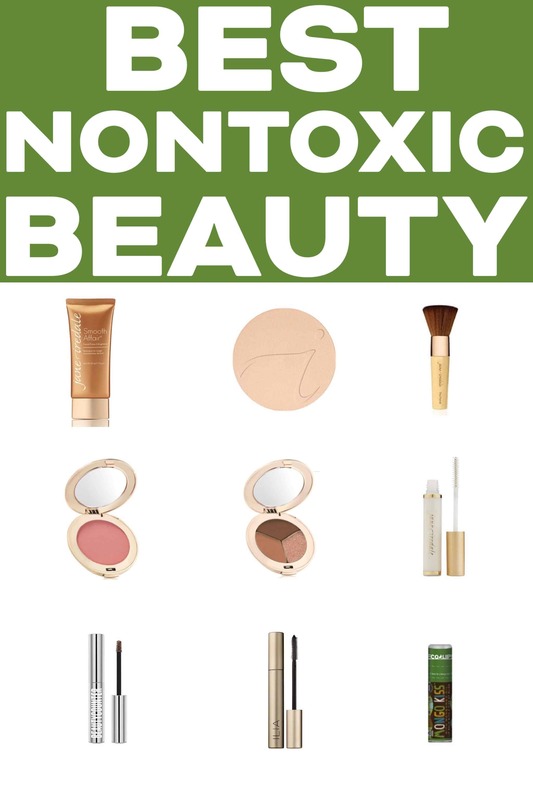 Here I share my favorite nontoxic makeup products, and share a video tutorial of my daily toxic free cleaner beauty daytime makeup routine so you can see all the products in action. 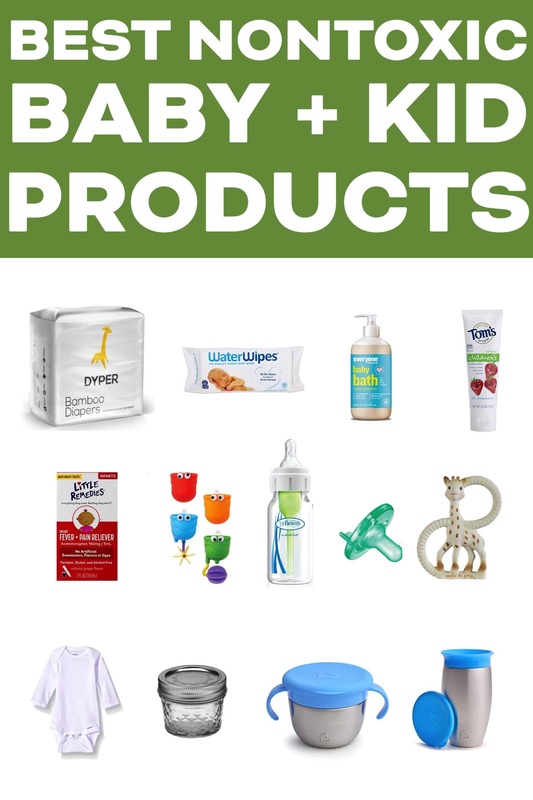 Here I share all my favorite non-toxic solutions for baby and kids, including diapers, wipes, bottles, clothes, etc. Sadly, your municipal water is not as safe to drink as you think. It is contaminated with pesticides and toxic chemicals. 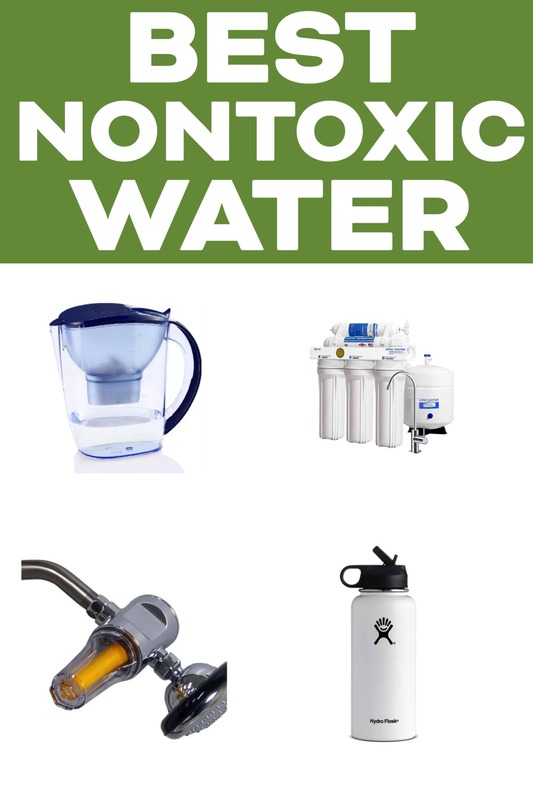 Here, I share my favorite water filters and water bottle for safer water. I absolutely love this post! So excited to read the additional info over the next few days and to check out those resources. I already swapped out my non stick pans after watching The Devil We Know. Thanks for all your hard work compiling this info! Thank you so much Sarah! I hope I can help you find safer, toxic free products you love! Wasn’t that documentary so informative! I swapped out my pans the NEXT DAY! Hahaha! Thanks for your kind words and encouragement. Honored to have you here following along!